After Maine Voters Approve Medicaid Expansion, Governor Raises Objections : Shots - Health News Republican Gov. Paul LePage vetoed Medicaid expansion several times before, so advocates took the measure to the ballot box. Now the governor is placing financial conditions on moving ahead. 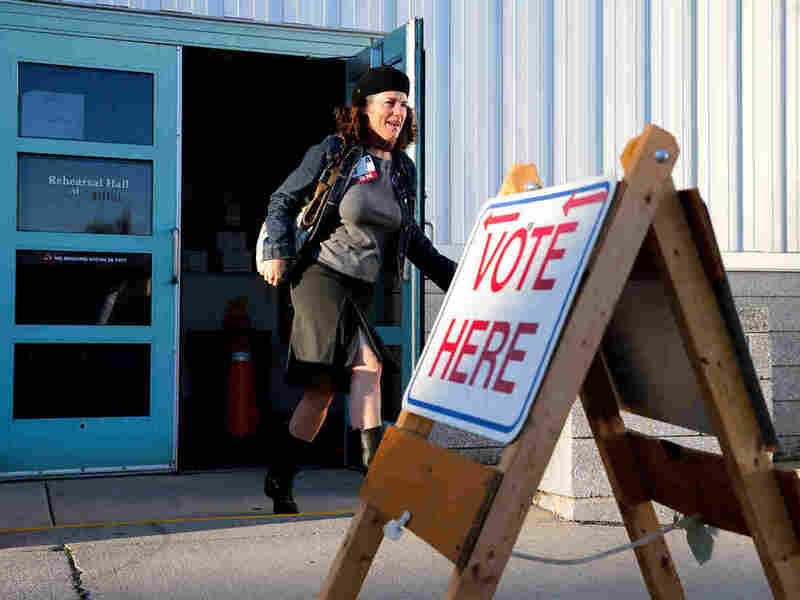 Rosemary Warnock, a registered nurse at Maine Health, exits the Merrill Auditorium voting station in Portland, Maine, early Tuesday. She said she was motivated to vote for Medicaid expansion. Just hours after Maine voters became the first in the nation to use the ballot box to expand Medicaid under the Affordable Care Act, Republican Gov. Paul LePage said he wouldn't implement it unless the Legislature funds the state's share of an expansion. "Give me the money and I will enforce the referendum," LePage said. Unless the Legislature fully funds the expansion — without raising taxes or using the state's rainy day fund — he said he will not implement it. LePage has long been a staunch opponent of Medicaid expansion. The Maine Legislature has passed bills to expand the insurance program five times since 2013, but the governor has vetoed each one. That track record prompted Robyn Merrill, co-chair of the coalition Mainers for Health Care, to take the matter directly to voters on Tuesday. "Maine is sending a strong and weighty message to politicians in Augusta, and across the country," Merrill said. "We need more affordable health care, not less." As a battle now brews over implementation in Maine, other states are likely to be watching: Groups in Idaho and Utah are trying to put Medicaid expansion on their state ballots next year. With passage of the ballot measure, Maine is poised to join the 31 states and the District of Columbia that have already expanded Medicaid to cover adults with incomes up to 138 percent of the federal poverty level. That's about $16,000 for an individual, and about $34,000 for a family of four. Currently, people in Maine who make too much for traditional Medicaid and who aren't eligible for subsidized health insurance on the federal marketplace fall into a coverage gap. It was created when the Supreme Court made Medicaid expansion under the Affordable Care Act optional. That's the situation Kathleen Phelps finds herself in. A hairdresser from Waterville who has emphysema and chronic obstructive pulmonary disease, she says she has had to forgo her medications and oxygen because she can't afford them. "Finally, finally, maybe people now, people like myself, can get the health care we need," she said. Medicaid expansion would also be a win for hospitals. More than half of them in Maine are operating in the red. Across the state, they provide more than $100 million a year in charity care, according to the Maine Hospital Association. Expanding Medicaid coverage would bolster their fiscal health and give doctors and nurses more options to treat their formerly uninsured patients, says Jeff Austin, a spokesman with the association. "There are just avenues of care that open up when you see a patient, from recommending a prescription drug or seeing a counselor," he said. "Doors that were closed previously will now be open." But state Democratic leaders pledge to implement the measure. "Any attempts to illegally delay or subvert the law ... will be fought with every recourse at our disposal," Speaker of the House Sara Gideon said. "Mainers demanded affordable access to health care yesterday, and that is exactly what we intend to deliver." This story is part of a reporting partnership with NPR, local member stations and Kaiser Health News. Follow @PattyWight on Twitter.